Using your dialog mobile number, dial #111# to activate ezcash account. You will get a PIN number which you should keep safety with you ( You need this to make withdrawals and to use other services of ezcash ). When you register using this simple method, what you will get from Dialog is a "Classic" Account. The maximum amount the classic account can hold is Rs 10,000 & per every 24 hours you can receive up to Rs 10,000 maximum. If you need an account with upto Rs25,000 limit, you can visit any Dialog center and request a "Power" account. If you have a smart phone, Download Dialog Selfcare app or ezcash app mobile app. Those who do not have smartphone does not have to worry at all !, You can always use #111# to check the balance and make Fund Transfer including all major payments supported by Dialog ezcash service. ( It is not necessary but it will make it easy to user services like eZ Cash Account Top Up, Send Money to other eZcash numbers, Reloads, Inward Remittance Service ( this is what we are going to discuss here ), bill payment, utility bill payments, pay merchants, institutional payments, internet payments, purchase products, balance check, mini statement, change PIN, check service charges and pay for donations ). Dialog Selfcare app seems to be much easier to use compared to ezcash app but use what ever you prefer and easier for you guys ! 3. Add your eZcash mobile wallet to your Skrill or Neteller Account and withdraw Instantly ! 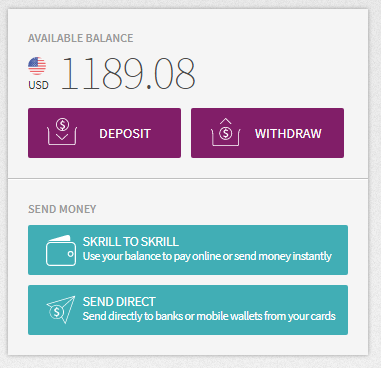 Go to your Skrill account. 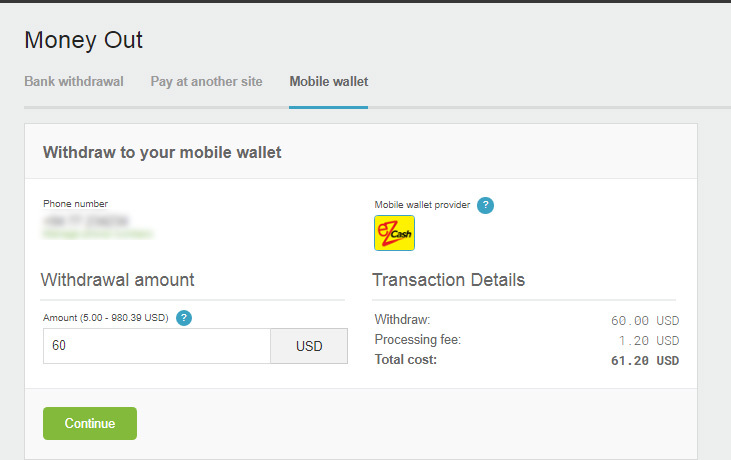 Then choose "Mobile Wallets" tab from your dashboard. You can see an ezcash account that already added to system right ? You can add mulptiple ezcash account as long as each of those accounts are under your name. 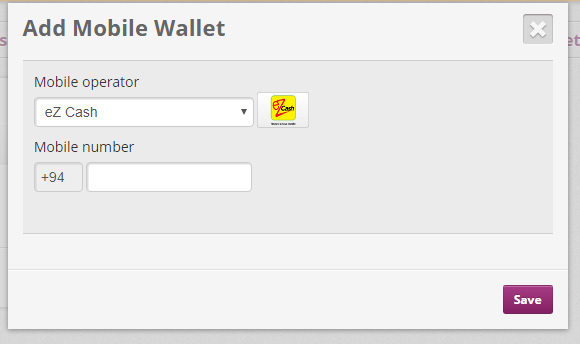 So click "Add Mobile Wallet" in order to add your first ezcash account or any more accounts. Then you will get a window like below screenshot. Now enter the already activated Ezcash Account. Double check to make sure the number you entered is correct. Then click "Save". So now let's see how you can get funds to it. You will then get a window like below screenshot. You can choose either ezcash account or bank account. For withdrawals above $500-1000 bank method is suitable but for Rs 10,000 or smaller amounts, ezcash is the best option. So let's choose ezcash as mobile ewallet ( If you have multiple account, you will get a drop down menu to choose a ezcash account ). Next mention $60 or lower amount in text box that says "Amount to withdraw"( Always make sure to mention $60 or lesser amount ) as you have a "Classic Account". Those who have "Power Account" can withdraw upto $160 every 24 hours. Then click "Continue". Remember : The maximum that you can hold in classic ezcash account is Rs 10,000 while the maximum that you can hold in Power ezcash account is Rs 25,000. So always make sure you have enough capacity to receive funds to your ezcash account ( So best option is always withdraw from ezcash once you reach close to maximum limit of your ezcash account ). From the next window you can see how much you will exactly receive to your ezcash mobile wallet. Then mention your Birth Date. Finally click "Withdraw Money" button. You will receive funds instantly to your account 😎 You will get a confirmation sms as well ! Go to Neteller account. Then go to "Money Out" > "Mobile Wallet". Enter your ezcash number. Just like in Skrill, Mention $60 or lower amount, if you have a classic ezcash account. From the next screen you can see how much you will receive exactly to your ezcash account. Click "Continue" in it. You will receive funds instantly to your account. 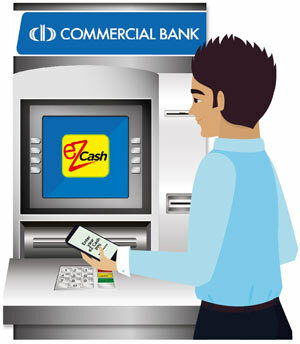 Now let's see how you can withdraw money already in ezcash account using combank atm. Go to a Combank ATM with "ezcash" logo. Then use the following simple method ! c) Choose "ezcash" from next window. e) Mention your ezcash mobile number. f) You will get a window in your phone to enter the ezcash "PIN" number. 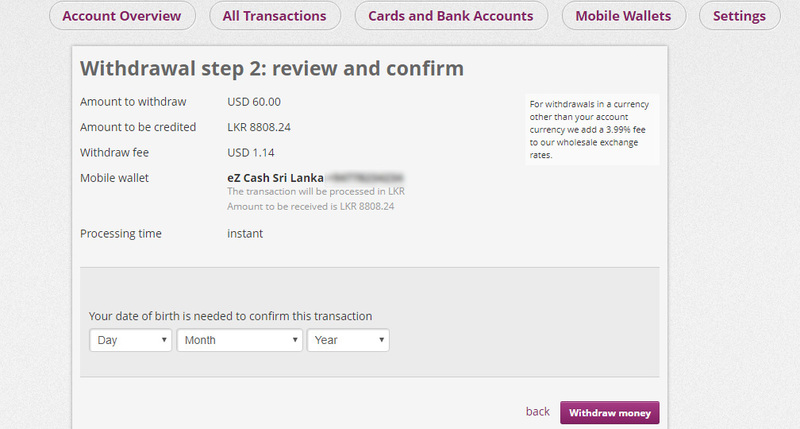 Also you can easily get funds using any authorized ezcash supported communication centers.